Long before diving into their curriculum, most higher education students spend significant time researching their options online. Here, we explore new insights from our research with TNS Australia to help higher education marketers ensure that they’re considered in key moments on the path to enrollment. Across industries, digital and mobile technology have caused a massive shift in how consumers consider and make both high- and low-consideration purchases. With near-instant access to information right at their fingertips, consumers’ most important decision-making happens in the hundreds of unique moments along the path to purchase, long before they ever reach out to a specific brand. Choosing a higher education institution is a pivotal decision, and a growing number of students in Australia are starting to research their options months—sometimes years—before enrolling. Every time prospective students go online to research, higher education marketers have a massive opportunity to show up with relevant digital content and help them make a well-informed decision. To better understand the research behaviour of incoming Australian higher education students, we partnered with TNS Australia for a quantitative and qualitative study that explores the higher education path to purchase.1 As part of the study, we spoke with 552 recent students from various institutions about their experiences and preferences. Here, we’ll break down three key learnings and takeaways higher education marketers can use to get on incoming students’ radars. Finding the right institution used to involve campus visits and flipping through stacks of brochures, but students today increasingly choose to spend their time researching online, bouncing between devices. In fact, 97% of students in our study researched their options online—the most of any vertical in our research. Search was a crucial resource for most of these students, with 57% using a search engine at some point during their path to purchase. Source: Google/TNS, “Path to Purchase Research—Education,” May 2017, Australia, n=552 Australian students (both undergraduates and postgraduates) aged 18–60 enrolled in higher education courses in the past two years. Interestingly, students were more certain about their choice of coursework than about their choice of institution when they started their research—72% of students started with a specific course in mind, while only 36% were sure of their provider of choice. When they’re ready to learn about an institution, students get the bulk of their information from providers’ websites. A site full of helpful information is paramount, but an institution’s search performance is still a top factor: 45% of prospective students reported that they have a better opinion of universities that appear on the first page of search results. We’re also seeing mobile become increasingly important to students’ research, particularly early in the process as students narrow their consideration sets. Higher education-related searches on mobile are on the rise, growing by 8% in 2017.2 And when an institution's website or app wasn’t optimised for mobile, 36% of students said they’d be less likely to revisit it. Aussie students keep their minds open to discovering and learning about new providers while they’re researching options online. Marketers should focus on being present online throughout the research phase and developing targeting and content strategies that speak to specific audiences, such as school leavers, mature-aged students, and international students). With more students choosing to research on mobile, it’s also crucial that marketers ensure that their websites and apps are optimised for a smooth, easy-to-navigate mobile experience and that attribution models are updated to accurately value mobile’s role in the path to enrollment. As fewer prospective students turn to physical brochures and campus visits, we’re seeing more of them seek out online versions of these experiences. Immersive video content can give students the experience of hearing from a real person, which is why 79% of students expressed a desire to learn about higher education institutions by watching videos online. Specifically, incoming students are interested in watching videos about the student experience, such as segments on course content, subject information, and campus life. A “Virtual Open Day” that features insightful and engaging content, such as virtual reality campus tours and alumni testimonials, is an effective way to bring the experience to students, especially those who might not be able to visit in person. While students have primarily taken their higher education research online, they still crave the experience of a real-life visit. Providing a variety of informative and engaging videos is a must for higher education marketers. But developing the content is just the first step; targeting the right audience with a range of video formats will ensure that the content is relevant and easily discoverable. While online study was once seen as a niche choice—primarily for mature-aged students in remote locations—the convenience and flexibility these programs offer have helped it become mainstream. Citing these benefits, 90% of students said they would consider online study in the future, but they still have some common reservations. Many students we spoke to emphasised the importance of receiving guidance from someone with hands-on experience with online study through online video testimonials or other helpful channels. To help students overcome their hesitations about online study, it’s essential for marketers to clearly communicate available resources and outlets for student support. Course features such as synchronous learning sessions and on-demand tutor support should be promoted through compelling video content or in-depth reviews written by recent or currently enrolled students. While students’ paths to enrollment have migrated almost entirely online, they still crave the knowledge gained by a real-life campus visit—and digital is making it easier for schools to bridge that gap. As higher education options become more readily available, institutions can capture prospective students’ attention by showing up online with helpful, relevant content and creating a seamless experience for them as they bounce between devices to help inform one of the most important decisions of their lives. 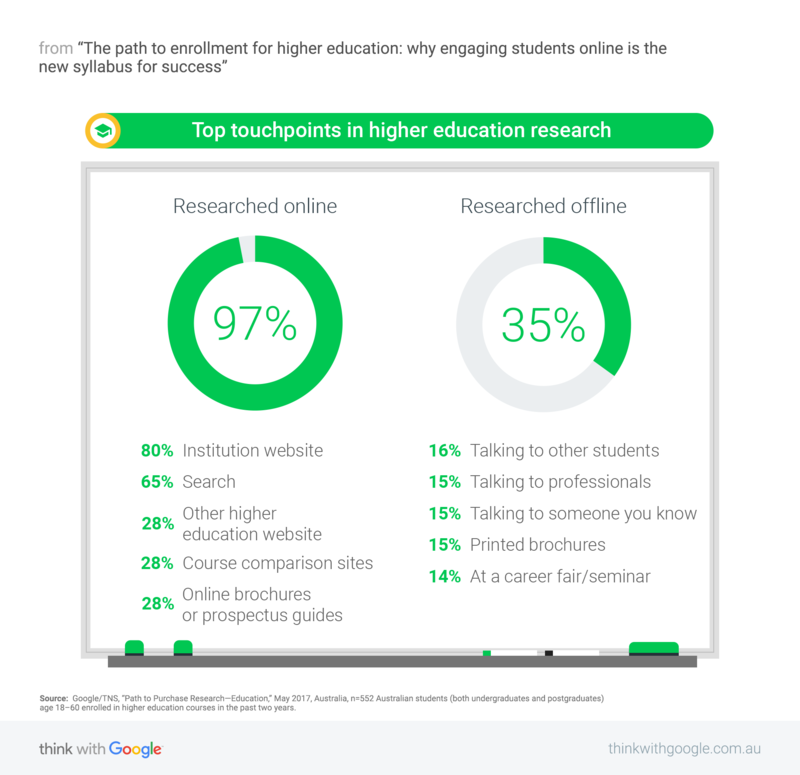 Google partnered with TNS Australia to conduct quantitative and qualitative research to explore the higher education path to purchase (where students look for information, how they enroll, what devices they use when deciding, etc.). In the survey, we spoke to 552 Australian students (both undergraduates and postgraduates) aged 18-60 years old who had enrolled in higher education courses in the past two years. Students were from both public and private providers and studied on campus, online, or both. 1 Google/TNS, “Path to Purchase Research—Education,” May 2017, Australia, n=552 Australian students (both undergraduates and postgraduates) aged 18–60 enrolled in higher education courses in the past two years. 2 Google Internal Data, 2017–2018, Australia.